These Mini Spinach Quiche are so easy thanks to store-bought pie crust. Make them in advance and keep them in the freezer. 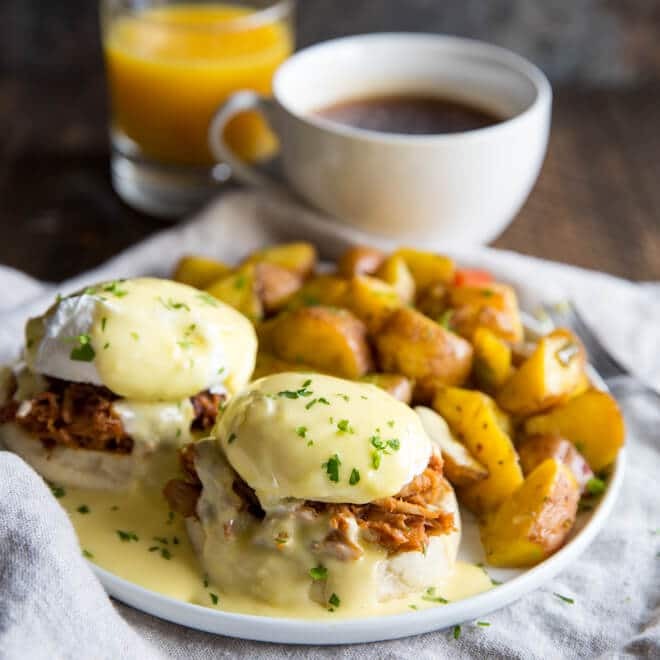 Great for parties and brunch! Mini Spinach Quiche are a great way to help guests, or convince kids, to eat more veggies! They are cute and colorful, easy to make, and so delicious. I love the color of spinach and red peppers, but you can substitute the vegetables that you prefer. How do you make mini quiches? How do you make a Spinach quiche? You start by wilting fresh spinach in some water and squeezing it dry. To use frozen spinach, thaw and squeeze the moisture out using a cheesecloth. Combine spinach and red peppers (or shredded carrot or finely diced onion or whatever you want) in the mini muffin cups. A mixture of milk, egg, and salt and pepper go on top. Then bake for 25 to 30 minutes. Follow the recipe and bake the mini quiches. Cool 10 minutes. Freeze individually on a plate or baking sheet until they are solid (about 30 minutes). Transfer them to a freezer-safe bag. Bake them straight from the freezer, in a 400-degree oven, for 5 to 10 minutes. 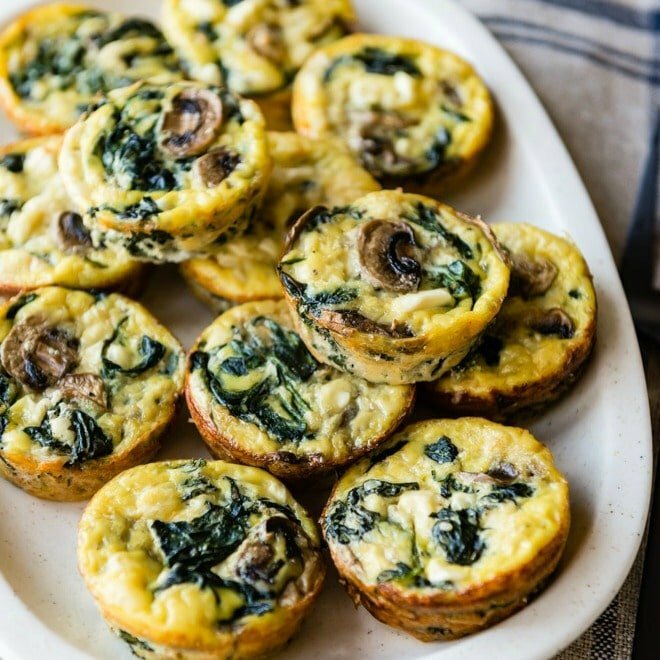 Save these Mini Spinach Quiches to your “Breakfast” Pinterest board! Place the pie crust pouches to stand at room temperature about 15 to 20 minutes. Preheat the oven to 375 degrees. Spray 48 miniature muffin cups with non-stick cooking spray. Open and unfold one pie crust, and press out any fold lines. With a 2 and 1/2 inch floured biscuit cutter, cut 12 rounds. Repeat with remaining pie crusts. In the prepared muffin cups, press 1 round of pie crust into the bottom and up the sides of the cup. In a 4-cup measuring cup, combine the eggs, milk, and the salt. Whisk well. Set aside. Place one tablespoon of cheese into each of the muffin cups. Evenly divide the spinach, about 1/2 teaspoon. Evenly divide the red bell pepper into the muffin cups. Pour egg mixture into each of the 48 cups, filling to within 1/4 inch of the top. Bake at 375 degrees until golden brown, about 25 to 30 minutes. Cool slightly and serve warm. To wilt the spinach, place spinach into small saucepan and cover with water. Bring to a boil and cook until spinach is dark green and wilted. Alternatively, in a small saucepan, place the spinach with 1/4 cup of water and sauté over medium high heat until wilted. Place spinach between two kitchen towels or paper towels and remove as much water as possible. What’s so great about this idea is that they’re so handy. Bake them then, wrap well and freeze them. I’ve had mine last for a month or more when frozen. No, they’re not as good as fresh but they’re still good regardless. I make mine crustless AKA a frittata so I use aluminum cupcake liners. Add all the colors of bell peppers and you have all the colors of Christmastime. Put it into a casserole dish with a pile of diced ham and you have breakfast for a crowd. Very versatile dish. Hi Kimberly! Reheat these straight from the freezer in a 400-degree oven for 5 to 10 minutes (bake them, freeze them, reheat them). You don’t want them to be at room temperature for food safety reasons. I updated the post with the reheating instructions. Thanks for your question! If you need anything else just let me know.